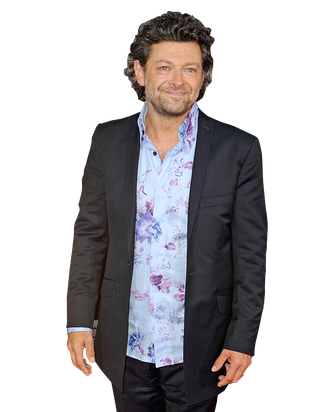 Famous for playing Gollum in the Lord of the Rings trilogy, Andy Serkis found even more acclaim (and Oscar buzz) this year for his motion-capture performance as Caesar, the simian hero of Rise of the Planet of the Apes. For that shoot, he wore a skintight Lycra suit and a face covered in motion-tracking dots to lope alongside James Franco, but the effects work and the performance were so stunning that you’d be forgiven for thinking a human had nothing to do with it. This winter, Serkis can be seen (well, sort of) in another motion-capture role as Captain Haddock in Steven Spielberg’s The Adventures of Tintin, but meanwhile, he’s busy with expanded duties on The Hobbit, where he’s not just reprising Gollum but shooting second-unit photography alongside director Peter Jackson. Luckily, Serkis found a moment in all that madness and called Vulture to discuss his biggest year yet. Congratulations on your recent deal for a sequel to Rise of the Planet of the Apes. It’s kind of unprecedented for a studio to make a deal like that for a performance-capture actor, and for you to be the first one signed on for the franchise, too. Obviously, it’s very gratifying. What’s interesting about it is that Fox has been really supportive in trying to raise the awareness of performance capture as acting, and I suppose that’s really the most pleasing thing about it. They completely understand where that’s coming from and the value of it, that it’s not some sort of stand-in activity, that the actor playing the role in performance capture is really delivering what they would in a live-action film. I can tell that you still run into people who don’t quite understand what it is you do with performance capture. What’s the biggest misconception about it? It’s funny: People don’t have any problem with actors dressing up in costume and makeup that completely hides their face or identity, but when it comes to doing that in the digital realm, there’s still almost a Luddite approach to it. But you can play a role without any of that extra stimulation that comes from costumes and makeup, because at the end of the day, when you’re looking into that other actor’s eyes, it doesn’t really matter what you’re wearing as long as you have that emotion of being in character. It’s an interesting moment in time, because with Rise of the Apes and Tintin coming out in the same year, they’re both performance-capture roles, but they’ve been manifested totally differently onscreen. One is a CG-animated style, and one is a live-action movie. People have been much more willing to understand the role of Caesar in Rise of the Planet of the Apes, but when it comes to Tintin, they assume that it’s just an animated character, even though exactly the same process is being used. Performance capture has come to be known as a genre or a specific type of acting, and really, that’s a mistake. Performance capture is a tool, and it’s just another way of recording an actor’s performance. You’re a motion-capture veteran, but Tintin is Steven Spielberg’s first crack at the format. Did you find yourself in the unique position of having to give him advice? He took to it very quickly because he’s a visionary filmmaker and of course he would, but actually, he reveled in the fact that it was new. I think for Steven, what he really enjoyed about it was the proximity of really being with the actors on the performance-capture set. Very quickly, you can experiment and reshoot without camera setups and lighting changes, because all of that’s done after the fact. Your Tintin co-star Daniel Craig has joked about how embarrassed he was to meet Clint Eastwood while wearing that motion-capture suit. I would imagine that by now, you’ve gotten over any embarrassment you once had wearing that. I got over my embarrassment about wearing a very tight spandex suit when it was the first day of Lord of the Rings and I was wearing it 6,000 feet up a volcano in front of 200 crew members. [Laughs.] There’s no time for embarrassment there! Have there been any advances in that outfit since you first started wearing it? There hasn’t really been a change in the suits, as such. In actual fact, for the kind of characters I do that are clearly physical, like Gollum or Caesar, you wouldn’t really want to be wearing anything else, because it does enable you to really use your body. Obviously, the thing that’s changed hugely with performance capture is the facial side of it: With King Kong, I was wearing over 150 tiny little markers, these little pin-heads all over my face, which was directly driving the facial puppet of Kong, but now, we use head-masks and camera rigs which film our faces. The actual suits themselves, though, haven’t really changed all that much, aside from when you’re shooting outside and on location, like we did with Apes. You put what’s called “live markers” on the suits, and they’re wired up so they can send a pulse that reaches the cameras in daylight conditions. Robert Zemeckis was working exclusively in performance capture for several years, but you never participated in one of his films. Was that ever something that might have happened? There was the possibility, because he was going to do a [performance capture] version of Yellow Submarine just recently, and I think there was some interest there. But I think the difference to Robert Zemeckis’s approach is that he wants to very much allow the faces of the actors he’s chosen to feature onscreen, to have the characters resemble the actors very closely. That’s a choice, but what I love about performance-capture and what I also love about acting, full stop, is the art of transformation, being able to use it to become something else. So in many ways, I see the difference between that kind of filmmaking and the sort of work that I’m involved in, really, which is more character-driven and getting away from myself as an actor onscreen. If I wanted [the Zemeckis approach], I could do that by playing live-action roles. What made you want to take on second-unit duties on The Hobbit? Listen, that really came out of the blue! Peter’s known for many years that I wanted to direct, and over the last ten years, I’ve been directing performance capture for short films and video games while gearing up to do my first feature. But it was not long before principal photography started that Peter e-mailed me and said, “Look, we’d love you to come and be second-unite director.” It was pretty much a shock! But it’s extraordinary. We’ve been shooting now for about 135 days, and we’ve got about that much to go, and it’s an amazing experience. The second-unit crew is a huge unit, and it’s like we’re shooting a movie ourselves. This put you in a unique position to now go off and shoot your own movies, but with your motion-capture career hotter than ever, do you ever wrestle with which of these things you want to devote more time to? At the moment, I’m very clearly devoting myself over the next couple of years to the directing projects I want to do. I’ve got a live-action movie that I hope to be doing soon and also a performance-capture movie that I want to direct. I’m not going to stop acting, because I adore and love it, but certainly at the moment, my interests lie more in directing, I suppose. I presume you’d star in the performance-capture movie you want to direct? Not necessarily, actually! As a form of expression, directing is calling to me at the moment. It really is. And I’ve gotta go with that, you know?